Milwaukee 48-11-2401 - 12 Volt lithium-ion cordless tool battery. Lithium-ion batteries deliver longer life and run-time with fade-free power. Ergonomic, compact and lightweight design for operator comfort. 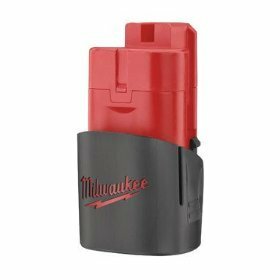 For use with Milwaukee 12-Volt tools and accessories. Clearing property lines with either pruning or general cutting blades, I get about 30 minutes of run time in a Milwaukee 2420-20 Hackzall Saw. Good service from Amazon. Have used batteies like this and get good service life. I use the drill heavily and am satisfied with it. This batteries and the quick delivery is the reason I choose Amazon for internet purchases. Milwaukee brand is the choice of people that know tools. Price is too low to display. Order now!